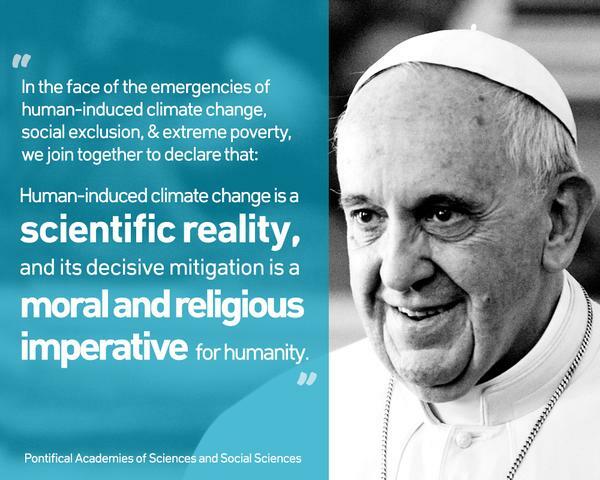 With Pope Francis issuing an encyclical this week declaring that we have "a moral and religious imperative" to cut carbon pollution, climate science deniers are scrambling to explain how their continued obstruction isn't immoral. Their new version of "I'm not a scientist" is "the Pope shouldn't mix religion and politics." In culture-war debates over gay rights and reproductive rights, for example, the right routinely argues that policymakers should heed the appeals from religious leaders. More generally, conservatives express alarm about the left trying to push voices from the faith community “out of the public square.” It’s these religious leaders, the GOP argues, that should help guide public debate. Except when the climate is on fire, at which point the pope is apparently supposed to keep his mouth shut? A related fraud: When polluter front groups like the Heartland Institute, which believes we should have no minimum wage whatsoever, claim to be better advocates for the poor than Pope Francis.